Poor soil was only part of the story that Campbell shared with his tour guests. Practically running between destinations, Campbell led an enthusiastic tour of the museum’s exhibits, and its collection holdings which are typically not open to the public. He breathlessly rattled off facts about the state’s natural resources and pointed out his favorite details in the four levels of displays and dioramas. On the first floor, nestled below the suspended skeletons of a sperm whale, a humpback whale and a manatee — Campbell’s favorite critter is a small shrimp, a few inches long, that vomits bioluminescent material to escape predatory fish. He walked the tour through explanations of sand dune progression, how sea level rise will affect the Outer Banks, and the stories behind how the museum collected each whale skeleton. “This one still drips oil now and then,” he said, pointing up to a blue whale skeleton whose bones alone are estimated to weigh three tons, with the head alone weighing one ton (alive and with flesh, it would have weighed more). As the tour progressed up through the museum’s exhibit levels. Campbell shared factoids about the state: N.C. has the greatest diversity of salamanders and fungus in the world; it contains the oldest river in North America, ironically named the New River; dinosaur fossils could be found here, excavated from quarries where the dense overburden was removed; N.C. has the highest mountain on the East coast, Mt. Mitchell, and it’s the state with the most number of peaks greater than 6,000 feet. The tour group peered at a siren salamander that breathes through gills, and a hellbender that breathes through vascularized tissue folds running the length of its torso. They looked into a longleaf pine forest exhibit with giant fox squirrels, a flashback to the pine savannas that used to stretch from the East coast to Texas. And they walked through displays of dinosaurs, proto-reptiles and proto-mammals — all creatures that used to live in what we call N.C. today. Campbell’s knowledge of the scientific details embedded in the exhibits was immense. In an age when most people don’t come into contact with the out-of-doors as often as they do cyberspace, this museum is a jewel in The Triangle because it’s not only a repository for a catalogue of the state’s natural resources, but because it does such a good job of telling the story of these resources to visitors. The exhibits are engaging and utilize enough live animals to bring out the curious kid in most adults. But perhaps the best part of the tour, at least to me, was the portion that wound through the collections in the basement. Forgive me for reminiscing here, but I used to be a staff science writer at a large southeastern natural history museum, and I knew from my past work that some of the best science stories come from museum collections and the scientists who maintain them. Ornithologist Becky Desjardins led the group through the birds collection, popping out drawer after drawer of specimens. Kestrels, peregrine falcons and hummingbirds, she had a story about each species. Mammalogist Lisa Gatens walked the group through the mammals range, passing around paper-thin hoary bat skulls, jumping mice skins, an articulated mole skeleton and pointing out a whale skeleton. She systematically showed the group the humerus, radius and ulna of each species, imparting a lesson in comparative anatomy. The tour ended with a trip to the paleontology lab where scientists knock dirt and rock matrix off of fossils with air drills, dental tools and an array of other tools to expose treasures from the past. It seemed fitting to end the tour in the paleontology lab. After all, it’s here that scientists peer into the fossil record of the Triassic. And it was in the Triassic, after all, that the decision was made to make Research Triangle Park. The museum is building an expansion, an 80,000 square foot Nature Research Center. The new building will house collections and lab spaces, and will be designed to allow visitors visual access to the scientific processes that are usually hidden from view in traditional museums. By bringing scientific research to the forefront of it’s exhibits, the center will function to communicate not just scientific findings, but how researchers come to know what they know. Read more, and see a rendering of the new facility. If you’re a ScienceOnline 2010 participant, and you have a few hours to kill, I highly recommend visiting this museum. You can find visitor information here. Give yourself at least two hours to tour all four floors of exhibits. You needn’t bring snacks, there is a cafe on the fourth floor. 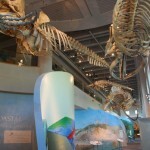 Make sure to visit the whale skeletons, the coastal plains, the mountains-to-sea ecosystems, and the pre-historic N.C. sections, including the acrocanthosaurus – the only skeleton of this proto-T-rex species on exhibit in the U.S.
For more interesting articles like these, head on over to scienceinthetriangle. You can also learn more about different laboratory equipment such as where to buy new and used equipment, UV vis spectrophotometer price and more.